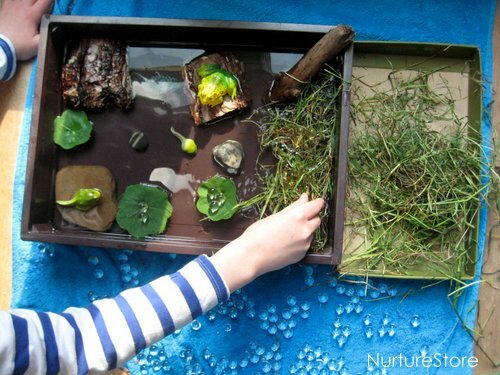 This small world play idea combines sensory play and loose parts to explore the frog life cycle. Come and take a look at our indoor pond! We’ve been rather disappointed to have found no frogspawn in grandma’s pond this year, as we really wanted a jar of it to study at home. But, we are not ones to sulk for long! 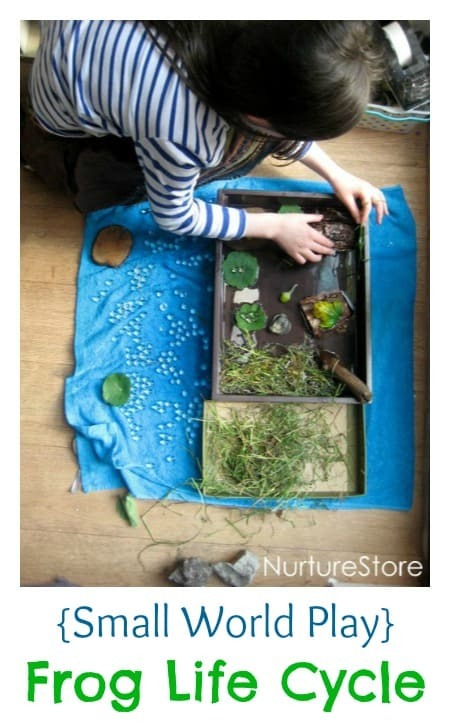 We decided to take matters into our own hands and do the next best thing: create a small world pond in the play room. 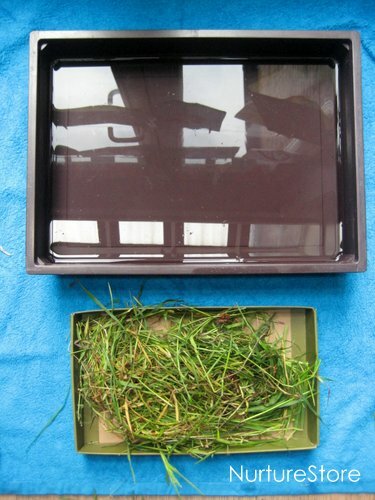 I set out a towel to catch any spills and gave the children a shallow tub of water and some grass from our garden sensory tub. And then we added in some loose parts that we thought might make good ingredients for the pond: bark, leaves, logs, pebbles. 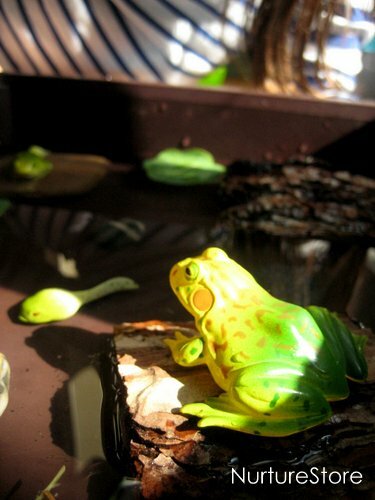 The frogs, spawn and tadpoles are part of a set from Insect Lore (affiliate link – NurtureStore gets commission for purchases via this link). 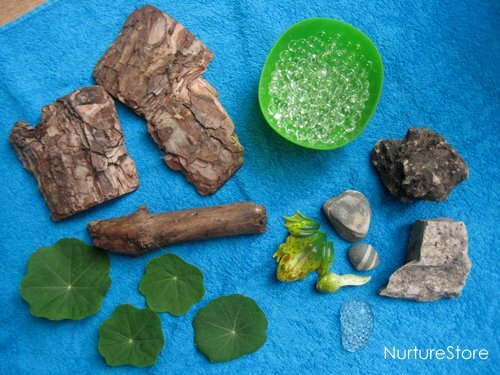 We’ve included some clear water beads, which are a great sensory material and make convincing frog spawn, but I would take care with them and certainly not use them if there is any possibility of your children putting them in their mouths. We had 6 – 10-years-old playing here, but for younger children you can simply omit the water beads and still enjoy a lovely pond small world. It’s tempting to set out the small world play scene yourself, but if you can resist let the children make it by themselves. 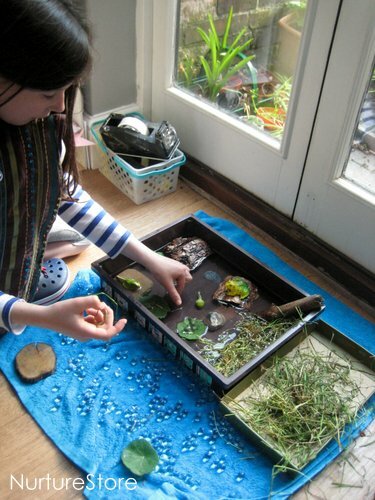 Whether they create a realistic pond, bringing to life the science and nature study they’ve been doing, or create an imaginary land, perhaps exploring story-lines about happy frog families or frogs and princesses, it’s always interesting to sit back and observe, and get an insight into what is going on in their thoughts. 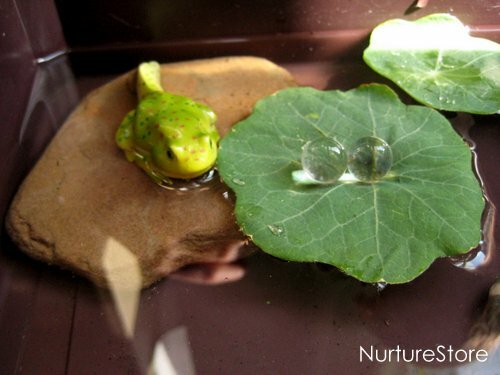 and that bark floats – giving our frogs a great place to hang out and tadpole-watch! 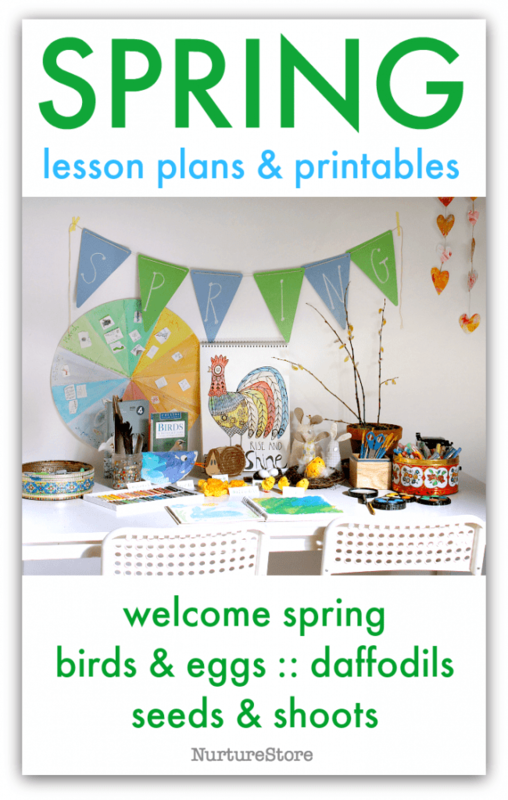 If you’ve never set up a small world for children could I encourage you to give it a try this week? I’ve never met a child who doesn’t like them! And especially try one if your children are a little older (it’s my 10-year-old you can see playing here) because I think that opportunities to enjoy this kind of small world imaginary play disappears from classrooms as children get above six, seven, eight… years of age, but really they are still such a valuable and enjoyable way for children to play and learn. Another substitute for eggs would be soaked basil seeds , which are sold in oriental food stores as a tea – look just like the real thing and non toxic. Ooh, great tip Sue – thanks!